Sign up for standard UK Unlimited Delivery for the whole year. Standard delivery from 2-3 days to 3-5 days. New Price £3.99 or free on orders over £70. Updates via SMS & email on the status of your order, a 1 hour delivery window by SMS & email, option to divert your parcel or leave more instructions. Order before 8pm to receive your order next day. Certain postcodes excluded. FREE delivery to over 650 stores. Get your order delivered to a local store within 2 - 3 days. Your order will be delivered within 3 to 10 working days depending on the location. View our help pages for further information. Click here to find out more about locations we deliver to, pricing and delivery times. *Please note – Orders shipped direct from our brand partner must be returned directly to them using the free returns label. Once they’ve received the goods, the brand will then trigger a refund. All orders can be returned within 14 days of purchase for free to one of our stores, while you can exchange your items within 28 days. You will just need to take your despatch note and the goods you want to return, and the store team will be happy to assist you. •	If you've ordered through an instore kiosk and would like an exchange or to return an item, you will need to do this instore as we are unable to process exchanges or returns for kiosk orders via our Distribution Centre. •	If you've paid using a credit/debit card, a refund/exchange will be processed at the till point. •	If you've paid using PayPal or Apple Pay, we'll send your order back to our distribution centre on your behalf so the transaction can be reversed. 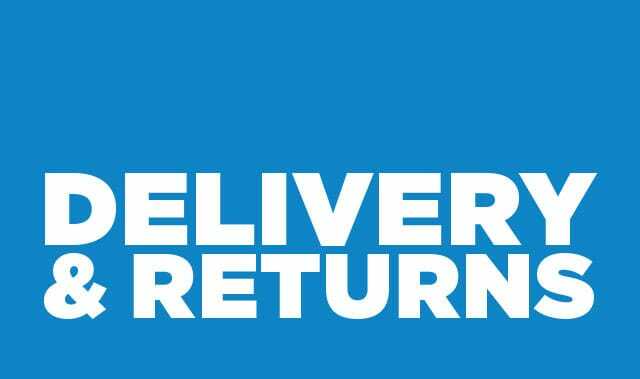 Returns Courier Collection for only £2.50 you can also arrange a courier collection from your home using myHermes. Visit MyHermes to arrange the collection details or print a label.